Wimmy wham wham wozzle. It's time for another party. Geotech number # 2 is happining at Bar 303 with some wicked eclectic & original electronica from a massive lineup of local artists and producers from around Melbourne. 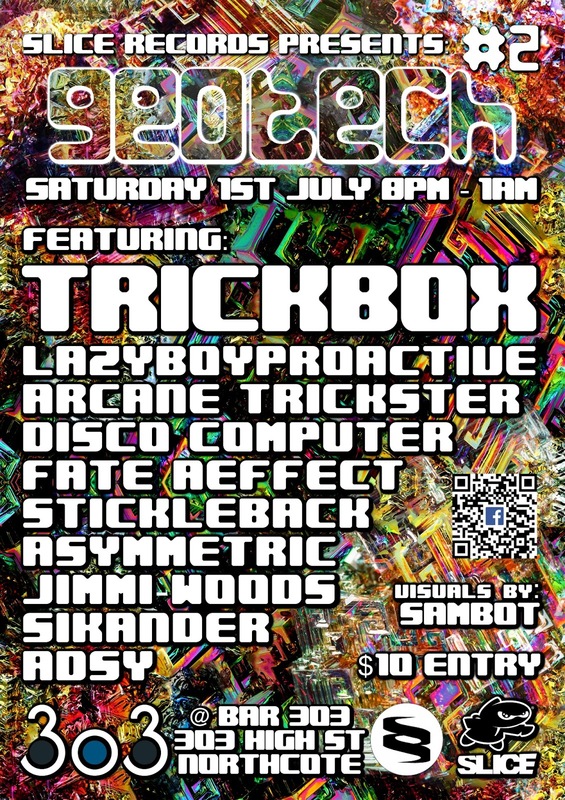 There is going to be heaps of live electronica! Trickbox from (Culture Jam) with a bag full of cheeky tricks to get you moving, 3 piece 'Sikander' playing some Space Disco Psychedelica, LazyboyProactive with live drummer pumpin out future pop electric body music, the all analogue electro duo that is Disco Computer, Jimmi-Woods back and bangin out the tunes, Adsy mixing up a storm sure to make you boogey, Asymmetric showing us how it is done with A grade production, Arcane Trickster chillin the place out launching 'Far from Here", Stickleback that hep cat with the crisp beats launching his new album "Fireworks" and finally Sambot making the place shimmer with whacked out visuals. Gonna be massive and wicked fun. Hope to see you there! ―Slurms MacKenzie. Date: 1st of July, 2017. Location: Bar 303, 303 High Street, Northcote.